Billboard’s Breakout Band at SXSW 2015; Winner of the Emerging Artist Series, US Cellular Stage at Summerfest WI, 2015; Winner of WYCE’s Album of the Year 2015; Best New Artist 2015; Art Prize, St. Cecilia Listeners Choice winner for the song The Silence 2015, Red Hot Best Band MyNorth Magazine three years in a row… THIS is the band to watch. Described as, “one of the most ground-breaking musical experiences one might just have in a lifetime” by Jonathan Frahm at Yahoo Voices, The Accidentals are just getting started. From 2012-2014, The Accidentals recorded three original albums, were guest artists on fifteen others, scored two films, and landed song placements in commercials, documentaries, and music compilations while playing over a seven hundred live shows. THEN they graduated high school. After graduation from world-renowned Interlochen Arts Academy, The Accidentals added multi-instrumentalist-singer-songwriter, Michael Dause, as their touring/studio drummer and opened for musical greats such as; Andrew Bird, Sixto Rodriguez (Sugar Man), Brandi Carlile, Dar Williams, SHEL, Ladysmith Black Mambazo, Ben Solee, Seth Glier, Rusted Root, The Wailers, Keller Williams, Arlo Guthrie, and more. In 2015 they scored original pieces for a 72-piece orchestra, an opera-dance project with Son Lux (Glassnote Records), and a smaller 30-piece string ensemble while touring the US extensively. The Accidentals played over 230 shows at some of the most prestigious venues and largest festivals in the US, including The Fillmore, The Vogue Theater, Frederik Meijer Garden, Chicago Botanic Gardens, Summerfest, Electric Forest, Summer Camp Festival, and toured the country nonstop with three West Coast tours, two East Coast Tours, and a southern stretch to Headline the BMI showcase at SXSW 2016. Named one of the top 10 bands to see at SXSW by Vinyl Magazine, this band is not slowing down. Picking up management with All Good Factory, Nashville (Ben Folds, Cardboard Kids) and booking with Fleming Artists, and releasing an long awaited EP in June, the Accidentals are looking forward to the best year yet. Hang on tight…it’s proving to be quite the ride. 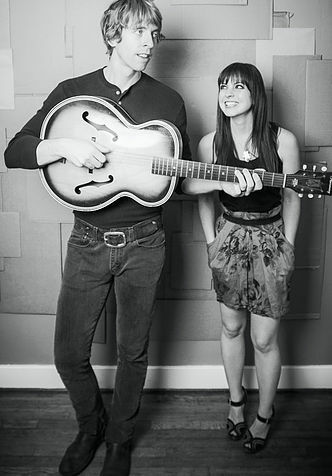 Adam & I are Adam and Andrea Melia, a Nashville-made indie folk duo that captures the energy of current americana styles while exploring the roots of American musical forms. The husband/wife team began performing together in 2012, and since the start of 2014 have released one full length album, two EPs, and played over 130 shows across 39 states. Adam & I spent most of 2014 and the first months of 2015 on their Our House Has Wheels Tour, playing over 70 shows throughout the United States. In March and April of 2015 the duo rented a house in Warrenton, VA to await the arrival of their first baby, and to record a new EP entitled Meanwhile in Virginia. Released on July 10th, 2015, the 5-song EP was critically acclaimed as “some of the finest duo folk-rock, alt-country songwriting I’ve heard in awhile” by No Depression’s John Apice. Adam & I embarked on The Meanwhile Tour, baby-in-tow, in summer of 2015. Hitting 38 states in only six months, the budding family band enchanted their growing audiences, playing a variety of house concerts, universities, and venue shows across the country. Adam & I returned to Nashville in November 2015 to record their newest EP, Back in Tennessee. The 6-song project is set to release on April 8, 2016 as a follow-up to their previous EP Meanwhile in Virginia, showcasing four brand new selections as well as two fan favorites from the road.